Today we are debuting the GA Podcast. Podcasting is part of our campaign to use new media to reach many UUs in many different ways. New podcasts will be available on the first and third Wednesdays of each month. In our inaugural episode, we have an interview with Denny Davidoff, former UUA Moderator. 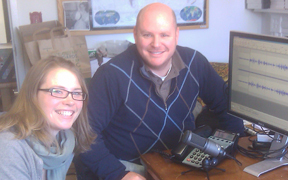 The GA Podcast is co-hosted by Melissa Saggerer and Don Plante. You can subscribe to our Podcast’s RSS feed or listen to our first episode.